Kassel-based Rita Fürstenau, illustrator and co-founder ofRotopolpress, a publishing house for graphic storytelling, recently stopped by the Goethe-Institut Toronto on her way to the Toronto Comic Arts Festival 2015 (TCAF) and chatted with writer/librarian Michelle Kay about ignoring Berlin, being an artist in Kassel and some ridiculously outdated laws. What is it like to operate a publishing house in Kassel? It’s nice. The city is a small city, so it’s quite calm. You have a lot of time to concentrate on your work and what you’re doing. Also because Kassel is in the centre of Germany, it’s very easy to travel to other cities to visit festivals or fairs. It’s a good home base. The rents are not high, so that’s also nice. It’s a very green city. We are the only ones who are doing what we are doing. We also have a store and a gallery as well. It’s very easy to go to other places. On your website, you say you’re "ignoring Berlin’s excited call." (Laughs). Yes, that’s true. When we finished our studies, most of our friends moved to Berlin. That was how it was back then. People would go to Kassel to study at the School of Art and Design and when they finished they moved to Berlin or Hamburg or Munich to get jobs there. We heard a lot of people were going to Berlin. They are not the only ones [there doing art] because Berlin is the centre for comics culture and illustration, so it’s quite hard to find an audience because everyone is struggling [to reach] the same people, to get some attention. In Kassel, we are [unique in that sense]. Everyone who is interested in the things we are doing knows where to find us. Also, we like the city, so we [thought it would be] better [to] start and build something new and get a lot of support from the city council because they really like us being there, which is quite nice. Would you say that Kassel has a defining artistic style? Maybe the defining style is, there is no style? (Laughs) Because what you usually find at art schools and universities in Germany, is that you have the professors and their style and their working techniques. And then the students go with this [particular style] and grow into this style. At least at the beginning. The professor in Kassel, he really tries to avoid that. He forces you to find your own style. And so the works from people in Kassel, they look really different. We really like that. Also for us, as publishers, it’s important that the works that we publish have their own style and not try to imitate something that is trendy. How do you select the artists and illustrators that you work with? When we started, the first projects we published were our own projects. Then we started to look around and found projects from people who studied at the same university. And then we started to go to festivals and fairs. We met people there. That was also the time when students realized we were there, so they would come with their works and show them to us. This is how we found a lot of people we collaborate with, many artists. Also, we always have a lookout on the internet. When we come across a project we like a lot, we will write the artist and ask him or her if they can imagine publishing with us. You have a couple Canadian artists on your roster. For German audiences, this project is really far from what they know, stylistically especially. But I think now people are starting to notice, so that’s really good. Yes, that international bridging of artists and audiences is really cool. We have this mandate—we really try to support young, German artists with their projects, but we also try to have an eye with what fits into the program and what we’re interested in and how to find a combination with books that are already published in foreign companies and bringing the new ones [to German audiences]. How important would you say it is to create a network of artists? I think it’s really important. The first idea was to build up a network called Rotopol and then have the publisher play in between the other parts of it. It just turned out that the publisher part needs so much work and time that this is the biggest part at the moment. But we still refer to our network very often and also try to support it not only with publishing books but also with creating exhibitions and setting up group shows and inviting different people (not only people we publish) but other artists as well. And then maybe it turns out later on we will publish one of their projects but not necessarily at the beginning. [It’s not limited to only] people who work in a format like a book or only do editorial illustration. I want to ask about publishing other formats too, not just books because you have tote bags and calendars and such. I really loved the oversized accordion-style of “Old Songs New Songs.” Was there a decision to create or publish people that aren’t just doing a traditional book format? It’s something we’re really interested in. During our studies, we always had the possibility to discover the right format for every project, so this is something [that was encouraged] in Kassel, at our school by the professors—to always be on the lookout for the right format for everything. For us, it was very easy to just continue doing this when we finished our studies and keep going and finding solutions for every project, the right fit for them. It turned out that sometimes it is better to have something like this leporello book (a style of book binding that folds out like an accordion ) where you have the possibility to look at a booklet with two pages each but also to fold it, unfold it into one continuous piece and content because it’s better to have it on one picture so you can connect it, the different parts of it without turning pages all the time. This is why we keep going and doing these projects. With the stationary and tote bags, we also have a screen-printing workshop (in-house) and we, especially my husband and myself, we do a lot of screen-printing so it is nice to have the possibility to print on textiles as well. Because we don’t just do comics, we also do illustration, it’s nice to have these smaller projects we can fit into a schedule that is quite busy. We still have some space and time to do a [smaller project like a] tote bag or a set of postcards. About “Old Songs New Songs” and the influence for the book, how did it come about? It’s been some years, actually. I read an article about the States, where it happens, once in a while, people are brought to court on the basis of laws that are really old and really strange and that these laws still exist in the law books. And I thought that’s interesting so I started to do research on this and to collect old laws that are still in the law books. It turned out that this is not a special thing to the United States but around the world that there are several laws that have never been removed. For example in Hessen, the part of Germany where Kassel is, they are still allowed to use the death sentence. There are other laws are on another [judicial] level so these very old laws cannot be used anymore but they have not been removed. I thought this was interesting because you have the possibility to remove the law but you really have to want to. So I found that there was a very interesting collection of law texts that all point to several things. For example, most of them would set up rules for very private things, private lives. Many of them include discrimination against several groups of people such as against women or children or native populations in a country, so I thought this is something that is very interesting because many of these kinds of discrimination still exist in our time but no one would speak about it out loud or even bring it into the form of a law that would have consequences. I thought it would be nice to work with this collection. It took me some while to figure out how to bring them together. Not just showing the text or doing funny things from it because there is a seriousness although they are really funny from today’s perspective. Are there any new artists whose work we should be on the lookout for? Actually, we just added one new artist to our list. Her name is Anna Haifisch and we will publish her first bigger book project this year. What do you have on the go for the next little while? 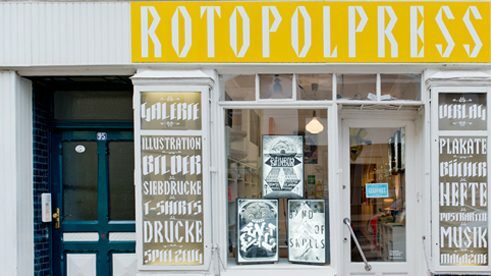 What does Rotopolpress have happening? Last winter we started this project called The Mystery Show. It’s an exhibition project where we send sets with little objects in small cardboard boxes to artists and ask them to create a single illustration that combines this object in some way. We had the first collection last winter. It was called The Forrester’s Collection, so for this upcoming winter, we will have the second one. We are planning this at the moment. Then we are working on some new book projects such as Thomas Wellman’s Pimo and Rex series. We are publishing the second issue. I’m working on a new set of sketchbook notes to print this fall. Short clip of the "Ambient Comics II Launch Party" with artists Rita Fürstenau and Nadine Redlich during this year's TCAF. Michelle Kay is the Online Editor and Librarian at the Goethe-Institut Toronto.